I am a proud Mommy yet again. All of my websites started because my kids came home from school telling me that almost all of their friends had no idea how to make friendship bracelets. My girls LOVE making them. It is one of those relaxing things you can do while going on a long drive, sitting on a flight, or just sitting in the house bored watching television. Kids have so much more stress these days than we ever did but because of busy lives they do not always get taught what to do to relieve stress or pass the time. In the beginning of it all I just wanted to find an easy way to show girls how to make friendship bracelets. As I started to make the main website I realized that I wanted to branch out further and provide a way for girls that have very busy families to learn things that normally were passed down from mother to daughter. Well. through it all I never saw the interest in the friendship bracelets like I thought I would. That is until now… The past week almost all of my top search engine keywords for the main site have to do with the friendship bracelet pages. It must be a summer thing. So I decided that I would tell you all that I have some instructions on making friendship bracelets on the main website. Summer is a great time for kids to make them. As kids sit bored they are a great, cheap, and easy hobby to keep them busy. 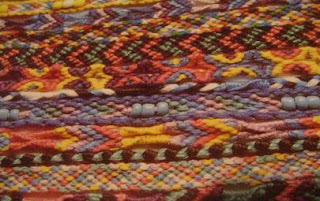 If you would like to see all of the instructions please check out the Friendship Bracelet pages. I actually stopped adding more types because people seemed not interested. If people are actually interested I can add instructions for harder bracelets. Iloved making and giving these as a kid!! I also loved making these as a kid. A couple of years ago while I was at the library with my kids I found a couple of books about making friendship bracelets. We checked them out and stopped at Michaels to pick up some floss. It was a lot of fun to be able to share something I loved as a girl with my kids. My daughter still wears the one we made together (I started, she finished) almost 3 years later! Ah thanks for the instructions these will be fun to make with my daughter. Hello from a fellow Wisconsin gal too, I live in Oshkosh. They look great fun I am going to have a go at this with my daughter! I made these as a home school exercise with my son. He has Aspergers and finds it difficult to understand the rules of friendship. Making these bracelets helped me to explain the give and take rules that friends engage in. This is terrific! My daughter Ava is so excited to get started making a friendship bracelet now. I am not the most artistic mom so this helps!